A history of the Cossacks from earliest times as they bartered for their social freedoms in exchange for military service, contributing to the expansion of the small Tsardom of Muscovy into a vast Russian Empire. Cossacks fiercely defended their independence for centuries in a period of serfdom. The creation of an army of super warriors has been the dream of rulers and politicians since time immemorial, epitomized by the Mamluks and Janissaries, or in more modern projects of designing genetically modified soldiers (fortunately, still at the drawing board). However, few people realize that there is a country, which had been successfully using the advantages of such an army for ages. In Russia, the Cossacks were no substitute for the regular army, but were instrumental in expanding the frontiers of the small Tsardom of Muscovy into a giant Russian Empire eventually becoming responsible for guarding its borders. In Tsarist times, the Cossacks were subjugated, and an honorable compromise was devised: military service in exchange of freedom. In the age of monarchies and serfdom, Cossacks remained standalone communities, enjoying a kind of social freedom up until Soviet times. Today, there is little of the Cossack lifestyle left. However, Russia would not exist without the Cossacks, nor they without Russia. The word “Cossack” (of Turkic origin) originally meant “free man, warrior.” The English spelling of this word reflects the way it is pronounced in Ukraine. However, in Russia, it was pronounced and written differently, as “kazak.” Like the Tsardom of Muscovy, the Cossacks entered on to the stage of history, under their present name, in the 15th century. This Turkic meaning of the word became an integral part of the Kazakh khanate in 1460 (meaning freedom from former suzerains), and subsequently became part of modern Kazakhstan’s official country name. For many centuries after Attila’s Huns erased all trace of the presence of Scythians and Goths in the steppes north of the Black Sea, the plains between the Dnieper, Don and Volga rivers were successively taken over by Turkic tribes such as the Bulgars, Khazars, Torks, Pechenegs and Cumans. At the time of the Crusades, those tribes warred or allied themselves with various Kyevan Rus princes, contributing to their internecine fighting in 11-13th centuries. This drama was vividly illustrated in Alexander Borodin’s epic opera Prince Igor (the most recent production was staged in Moscow last June 2013 by Yuri Lyubimov). It is hardly surprising that this tumultuous historical background gave birth to masses of steppe peoples who mastered the craft of war, horsemanship and enjoyed their freedom after the break-up of the Golden Horde. Their military skills were one of the few goods they could offer for sale, so when raids into whatever neighbouring country stopped yielding enough gains, they acted as mercenaries for princes, tsars and kings of those same countries, which they had recently plundered. In Russia, the Southern steppes between the Dnieper, Don and Volga rivers were called “the Wild Field,” (Deekoye Pole) which was a somewhat similar concept to the Wild West and the US Frontier which unfolded in the 19th century. The fact that Cossacks were free people, owning private property, horses, with a rudimentary (or atavistic?) democracy of sorts, was an exceptional phenomenon for the period ranging from the 15-19 centuries. They enjoyed their freedom and military vagabond life for many generations – quite a genetic selection. To denote their freedom and liberties, the Cossacks used the word ‘will’ (volya), instead of ‘freedom’ (svoboda). Currently, there is practically no difference between the two words in the Russian language, but it appears that ‘volya’ has a wider meaning, meaning also (like in English) the determination to do whatever one wants. There is an interesting historical parallel: Lev Gumilev wrote that Chinghiz Khan owed his rise in the 12th century to the “people of long will,” outcasts, or people who left their tribes to live in the steppes, just like the Cossacks, who inherited the Horde’s steppes and expanded their ranks by absorbing people fleeing from serfdom and oppression several hundred years later. 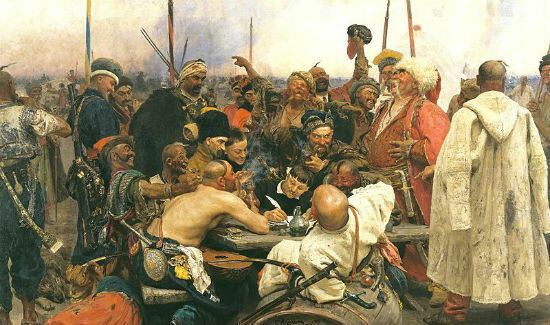 Cossacks valued their free status, and their freedom was the principal subject of any negotiations with would-be suzerains to whom Cossacks chose to swear loyalty, be it a Polish King, Russian Tsar, or Turkish Sultan. The encroachments on Cossack rights sparked many wars and rebellions in Poland and Russia, making the task of managing this unruly folk pretty tricky. The ethnic origin of Cossacks is an “enigma shrouded in mystery.” Theories abound that initially they were Goths, Khazars, Varangians, Turks, Chircassians, Tatars, and so on. 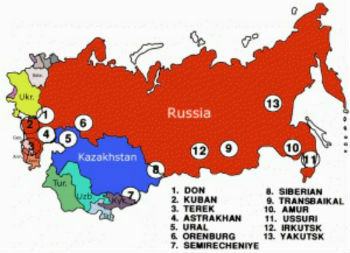 At the dawn of the age of the Golden Horde, the population of the steppes spoke mostly the Cuman (Kypchak) language, the Lingua Franca on the plains from the Danube to Kazakhstan, which explains the presence of many Turkic words in the key Cossack lexicon like “Ataman”/Otaman (Cossack leader, turk. father of horsemen), “Kosh” (Cossack military camp, community, turk. nomad group on the move), “Yesaul” (Cossack leader deputy, turk. leader deputy). However, the puzzle relates to how this Lingua Franca got replaced by the Russian language. There was no forced assimilation or wide-spread violence, at least not on a scale comparable to the Mongol conquest. On the one hand, this swift linguistic substitution, took place in a matter of a hundred years, or so – pretty fast by historical standards and given the length of the stay of the Cumans in the region. This may have something to do with the fact that the Turkic population of the region failed to preserve their alphabet and writing skills in the age of non-stop warring. On the other hand, the Cossacks may have inherited the Russian language and writing from Kievan Rus and later helped to spread it along with Christianity in the Steppes and Siberia. Last but not least, before the Mongol conquest, many Turkic tribes, including some Cuman clans converted to Orthodox Christianity. First, the Mongol khans practiced religious tolerance of a sort, with religious belief rising to the top of the agenda only before the break-up of the Horde. So, the religious factor presumably played a crucial role in spreading the Russian language in the steppe, too. Another historical brain-teaser: in the 15th century the word “Rus” was applied in the West to modern Ukraine, part of the Grand Duchy of Lithuania at the time. The Grand Duchy of Lithuania, which much exceeded the Grand Duchy of Muscovy in size, was its key political rival and hosted a significant Russian-speaking population. On the other hand, in Muscovite sources, the inhabitants of the territory where Ukraine is today located were called not Russians, but “Chercassy,” meaning “Circassians” (probably after the partial resettlement of a namesake tribe from the Northern Caucasus to Southern Russia in late 13th century by Golden Horde Khan Nogai). In 1547, the Tsardom of Russia was proclaimed, when Ivan IV (later called the Terrible) was crowned, but the dichotomy between Ukrainian and Moscow Rus lasted until the new Russian state included the bulk of Ukrainian lands after the fierce competition with the Polish–Lithuanian Commonwealth, and ended finally when the Russian Empire was announced by Peter the Great in 1721. The rise of Cossack glory took place in the age of freebooters and mercenaries and peaked in the mid-17th century. They earned their widespread fame in numerous wars, rebellions, raids into unknown lands and against overwhelming adversaries. There were three core Cossack communities: Zaporizh (Ukrainian), Don and Ural (Yaik) cossacks. Actually, there were many more, all of them forming a belt around southern Russia, across the former Kypchak steppes. Despite the fact that they often warred with Russian Tsars, their military efforts contributed much to the expansion of the small Tsardom of Muscovy into a vast Russian Empire. Starting from the 16th century, various Cossack atamans offered their services to the Russian Tsars and pioneered the exploration of Siberian and North American lands. In 1581, ataman Ermak spearheaded the military conquest of local Siberian hordes behind the Urals Mountains in Siberia, defeating the Siberian Khanate (Blue Horde). In 1635-1640, acting on behalf of the Tsar’s governors, Ivan Moskvitin’s Cossacks reached the Okhotsk Sea in the Far East. In 1645 Vasily Poyarkov’s Cossacks travelled along the Lena and Amur rivers and landed on the northern coast of Sakhalin island in the Pacific. In 1648, Cossack Semyon Dezhnev reached the straight between Asia and America (now Dezhnev Straight), with some of them staying in Alaska. In 1649 ataman Yerofey Khabarov mapped the banks of the Amur river. A considerable number of those explorers were Yaik and Don Cossacks, who settled along the Yaik river (presently, the Ural river in Russia, and the Zhaik river in Kazakhstan). The Cossacks’ lengthy Siberian raids were usually made in small numbers, with their parties not exceeding several hundred people. Pioneers were followed by new parties, which used previously founded settlements or built new ones. They were accompanied and followed by entrepreneurs and regular forces from the Russian mainland, but did not mix with them, enjoying their formal independence. Don Cossacks swore alliance to the Tsar of Muscovy. They helped to guard the southern boundaries of the Moscovy Tsardom from the raids of Crimean Tatars and Ottomans. One of their most outstanding feats was the taking of the strategic stronghold of Azov in 1637 and holding the siege against the Turkish Sultan’s overwhelming troops up to 1642, until ordered to desist by the Moscow Tsar. Zaporozhian Cossacks originally allied with Polish kings. In the early 16-17th centuries they participated in Polish campaigns against the Ottomans and the Tsardom of Muscovy (siege of Moscow in the fall of 1618). At the time, the number of Cossacks in the Polish registry, based in Ukraine, reached several thousands. Cossacks proved their valour not only in the steppes, or Siberian taiga. Starting from the 16th century, reports abound relating to Cossack naval raids against the Ottomans. At the time of the battle of Lepanto (1571), Zaporizh Cossacks continued the old Varangian tradition of going to Constantinople via the Dnieper. In the 16th century, Cossacks crossed the Black Sea in light boats dozens of times, freeing enslaved fellow countrymen in Turkey, and seizing coastal Turkish towns and returning with rich booty, quite in the spirit of the time (though not always safely). They remained a headache for Turkish Sultans in the 17th century. The Ottoman army and navy which were the strongest in the region could not do anything to stop the devastating raids by relatively small Cossack parties numbering as usual no more than several thousand people. Sealing the estuary of the Dnieper with chains and a powerful fleet, using the assistance of Tatar allies did not help the Ottomans to prevent Cossacks from coming close to the walls of Constantinople. 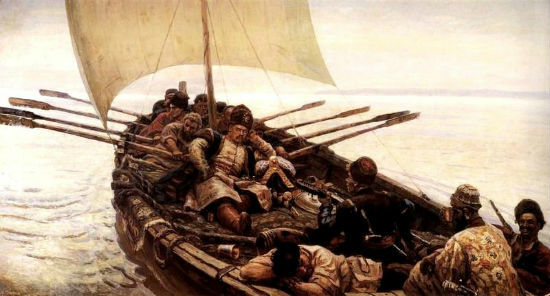 Similar raids were carried out by Don Cossacks in the Caspian Sea, the most famous of which, was in 1668, by Stepan Razin, when he defeated the Persian fleet in the Caspian Sea on his way back from another foray into the Persian domains. Even more far flung, in 1645, around 2,000 Cossacks participated in the siege of Dunkirk, where the Spanish garrison capitulated in October 1646. Historical confirmation is presently being sought that Bogdan Khmelnitsky, or Ivan Sirko, the legendary Zaporizh Cossack leaders, took part in the siege itself. In 1683, around 5,000 Cossacks took part in the battle of Vienna, as part of Jan III’s Sobieski Commonwealth army, which defeated the Ottomans. Jerzy Franciszek Kulczycki, the former Zaporizh Cossack with a tangled personal history, brought Vienna residents the news that relief would soon be at hand. For his heroic mission, which involved going back and forth through the enemy lines, King Jan Sobieski awarded him with a trophy of 300 coffee sacks seized from the Turks. Later, Yuri Kulczycki was to set up the first coffee house in Vienna, thus giving birth to the tradition of coffee drinking in Vienna. Cossacks did good services to their suzerains, but were not completely loyal to them. They were clearly outstanding warriors, though not very successful in combining geopolitical games with freedom. Probably, because the former required some kind of political unity, which is an antagonist of the latter. Trying to play on the differences between Poland, the Tsardom of Muscovy and the Ottomans/Crimean Khanate (allying with the weaker against the stronger), they often lacked the unity necessary to be consistent in pursuing their main interest, freedom. A key reason was the property schism in the egalitarian Cossack society, which made it easier for external powers to out-manipulate the manipulators. Property interests (selfishness) of the richer comrades damaged the common cause. For example, prosperous Zaporozhian Cossacks sought to confirm their rights with Polish Kings, willingly becoming part of the so-called registry Cossacks in the service of the Polish Kingdom. At the same time, rank-and-file Zaporozhians were more sensitive to the issues of religious and personal freedoms, which triggered numerous uprisings in the Ukraine against Polish rule and prompted a large part of the Ukrainian population to seek support from the Moscow Tsar. “Field commanders” from the Zaporizh Kosh military camp often opted to stay neutral on delicate issues of political alliances, setting their independence as their ultimate goal. 20 years later, the Don rebellion of Stepan Razin in 1668 was not so successful. Razin was betrayed by rich Cossacks and handed over to the Moscow Tsar to be tortured and killed. Forced to maneuver between strong neighbours, Cossack leaders employed Machiavellian tactics. In 1669, Zaporizh Hetman Pyotr Doroshenko swore allegiance to the Turkish Sultan. However, he lost popular support soon afterwards, when the Ottoman army visited the Ukrainian “allies,” and rumours spread that the Hetman had secured a hereditary title for his family from the new suzerain. Finding himself exposed politically, he swore allegiance to the Russian Tsar and ended his days as a governor of a small and safe region in Russia. As the Russian Tsardom gained strength, its conflicts with Cossacks became more frequent. In 1708, Kondrati Bulavin led the uprising of Don Cossacks but he followed the fate of Stepan Razin (betrayed and killed by a wealthy faction). On top of all the Cossack’s troubles, the Russian Tsar Peter the Great did not forgive the Zaporizh Cossacks the betrayal committed by their Hetman, Mazepa, who at the last minute before a crucial Poltava battle changed sides in favour of the Swedish King Charles XII in 1709 (Lord Byron, Victor Hugo and Alexander Pushkin poetically described Mazepa (Mazeppa)’s vicissitudes in their poems). This time, the rebellious Cossacks had to seek refuge from their arch-enemies, the Turks and Tatars. The Ottoman Sultan let thousands of Don Cossacks settle on his lands, while the Crimean Khan allowed another 20,000 Zaporizh Cossacks to establish their Sich, military camp, to the north of the Crimean peninsula. Eventually, the Zaporizh Cossacks were allowed to return to their lands in 1737. In the case of Bulavin’s Cossacks (to be exact, they were led by ataman Nekrasov), it took a bit longer. Their families lived in Turkey for 250 years, maintaining all their Cossack traditions and Christian faith, strictly following the order of their ataman not to return to Russia until the Tsars ruled it. In September 1962, around one thousand Cossacks finally agreed to go to the USSR (becoming themselves a source of rich and rare ethnographic material), although in 1963 another, around 200-strong party opted to go to the US. In 1774, Zaporizh Cossacks performed their last big geopolitical service to Russia in an independent capacity. They helped the Tsarist troops defeat the Turks and capture the Crimea. At that time, another Cossack uprising was raging in the Volga region. Yemelian Pugachev encouraged the Yaik Cossacks to turn against the Empress (see the Captain’s Daughter, another of Alexander Pushkin’s works on the Cossack theme). 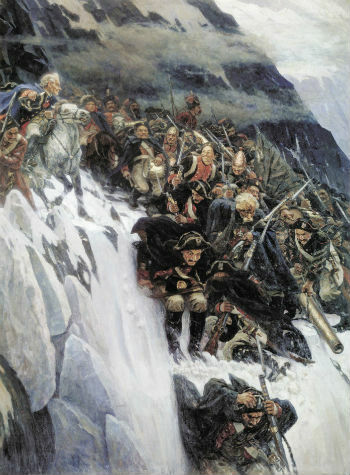 In order to wipe out the memory of Cossack firebrands after suppressing the rebellion, Catherine the Great renamed the river Yaik and the Yaik Army (Host) to the river Ural and Ural Cossacks, respectively. Also, in 1775, frightened by the scale of the Cossack uprisings, she decided to stay on the safe side and destroyed Zaporizh Sich, the heartland of the Ukrainian unrest, as the Cossacks there were more than unhappy about their historical lands being given away to Russian grandees and new settlers, with clashes between them becoming increasingly frequent. Thousands of Zaporizh Cossacks fled to the Ottoman Empire again, to meet their counterparts from Don, over the Danube river, who made it their home 70 years earlier. 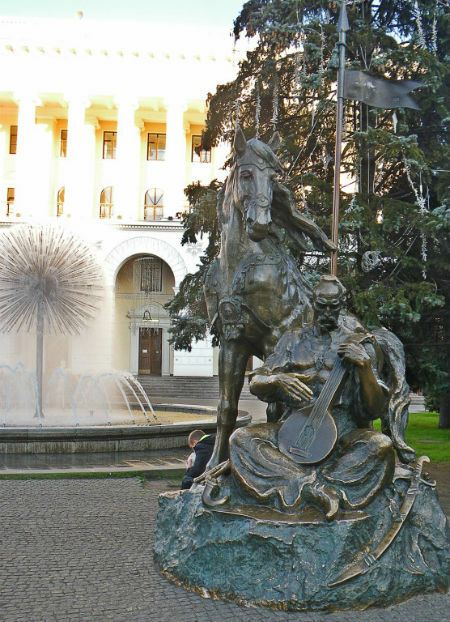 The remainder of Zaporizh Cossacks were resettled in Kuban, presently the Krasnodar region. 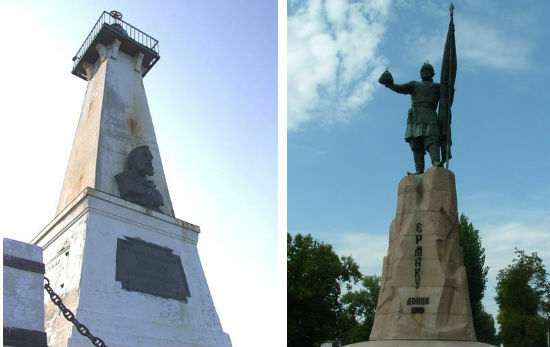 The Zaporizh Cossack refugees returned to Ukraine from behind Dunai “just” 50 years later, in the 1820s, compared to the Nekrasov Cossacks’ 250-year stay abroad. The 1770s signified the end to the Cossacks’ unlimited freedom and minor geopolitical games. Having failed to ensure their freedom, the Cossacks fell under the sway of the Tsar, or Empress, to be exact. In fact, the Cossacks faced a difficult choice, either fight against the Tsar and Christian compatriots, or sacrifice some of their freedoms. Also, with the Crimean Khanate out of the political scene and the Polish Kingdom severely reduced, the role of the Cossacks in the region shrank. Moreover, their energy and will to resist new challenges had significantly subsided, too. Actually, the terms of submission were pretty generous and honourable: relative freedom (at least, no serfdom) in exchange for military service. It seems, the Cossacks’ instinct for freedom fell into abeyance. But not for long, by historical standards – until the 1917 Bolshevik Revolution. Finally pacified, the Cossacks organically merged into the Russian Army and participated in its numerous campaigns. In 1799, under Alexander Suvorov’s leadership the Cossacks participated in taking Milan and Turin in Italy from the French revolutionary army. Eight Don Cossack regiments and two Urals Cossack regiments took part in Suvorov’s Italian and Swiss expeditions in 1799. Around 400 Cossacks were buried near Zurich after a battle between the allied troops and the French. A historical paradox, in the late 18th century, Empress Catherine the Great resettled the Zaporizh Cossacks to Kuban, the place from where some of their ancestors were reportedly moved by a Horde Khan in the 13th century (remember that initially the Ukrainian Cossacks were called Chircasses in Russia and the name of Don Cossacks’ capital is Novocherkassk). Now, they had to take part in the conquest of the Chircassians, their distant kin. Later, the Russian writer Leo Tolstoy’s encounter with the Cossacks during his military service in the Caucasus inspired him to write his novel “Cossacks,” while the Caucasus experience itself initiated a change in his spiritual attitudes. The Tsarist Government used Cossacks as border guards, garrison settlers, for field reconnaissance, etc. Inside the country, they often performed the role of riot police and were efficiently used to quell the Polish uprising in 1830. It seems, international tensions have always fluctuated between bad and the worst, and Cossacks often found themselves in the midst of them, gradually becoming a symbol of Russia/Ukraine, or vice versa. At the height of the Russian Empire, there were more than 50 Cossack regiments in the Russian Army. 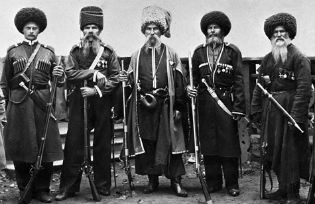 When World War One started, the number of Cossack regiments increased to 150, with around 200,000 Cossacks joining the Army. There were eleven purely Cossack armies in Russia by 1914, totalling around 3 million people. The share of Cossacks in the more than 150 mln Russian population was approximately 6.5%. And Quiet Flows the Don? Despite the Cossacks’ relatively privileged position in society, not all of them admired the monarchy. 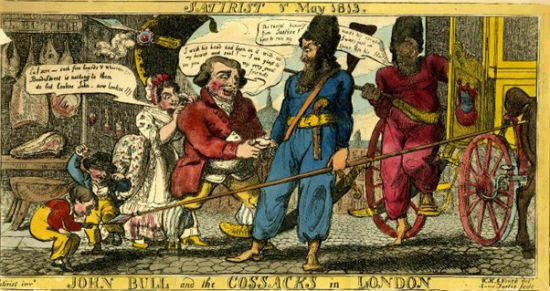 Inequality inside Cossack microcosms made their communities less homogeneous. So, World War One and the 1917 October revolution tore their lives apart, like it did to other layers of the Russian population, as depicted by Mikhail Sholokhov in his And Quiet Flows the Don. Initially, the Cossacks rejected the Bolshevik revolution and treated the commissars with suspicion. However, tired of war and snubbed by the aristocratic White Army commanders, they tried to establish their own independent self-rule. Later a large, poorer part of them switched to the Red Army. On the one hand, there was the Cossack general Pyotr Krasnov, elected head of the Don Republic, which existed until early 1919. On the other hand, there were Semyon Budyonny and Philip Mironov, who led the 1st and 2nd Cavalry Armies in southern Russia. Huge cavalry armies, consisting mostly of Cossacks, spearheaded major Bolshevik advances and determined the outcome of the Civil War. The seizure of Crimea, and the raid into Poland in 1920, as well as the taking of the Urals and Siberia, by 1922 had crushed the hopes of monarchists in the early 1920s. Thousands of anti-Bolshevik Cossacks followed the defeated tsarist troops to Turkey and Eastern Europe again, revisiting Paris (after 1812), with one-time fearsome warriors earning their daily bread as taxi-drivers. However, the Civil War was only just beginning. The notorious decossackization, the repression against well-off Cossacks, deportations to Siberia, the creation of collective farms and the famine of the 1930s made large masses of people resent the Soviet order. Having fresh memories of recent calamities, many of them, at least 100,000 Cossacks did not hesitate, to take the German side in World War Two, followed by many others ready to ally with the devil himself against the regime, not the country. On the other side, approximately half a million Cossacks fought in the ranks of the Red Army (purely Cossack units, not counting Cossacks in the rest of the army), led by Dovator, Belov and others. The Great Patriotic war of 1941-1945 was the only war in Russian history, when such a huge number of the Russian population took the enemy’s side and participated in active combat against their compatriots, adding to the dimension of the tragedy as the Russian Civil War went on raging inside the World War carnage. In the end, around 40,000 Cossacks and their leaders, including Atamans Pyotr Krasnov and Andrei Shkuro (emigrants since 1920s), were forcefully extradited by the allies to the Soviet Union in 1945 (the drama described in Ian Mitchell’s book The Cost of Reputation). The German Commander of the Cossack Corps, Helmuth von Pannwitz, voluntarily followed his subordinates, all of them meeting a grim end in 1947. The spirit of a free past did not leave Cossack places intact. In June 1962, the population of Novocherkassk, the capital of the Don Cossacks since 1805, challenged the local authorities by walking the streets under Soviet slogans, demanding an improvement in labour conditions (nothing political, just survival). This was the first time in the post-Stalin era when the Soviet army shot Soviet citizens. Carefully concealed at the time, the tragedy did not disrupt five-year long talks with Ataman Nekrasov’s Cossacks (see above) willing to return from Turkey after a 250-year stay there. Finally, they were given residence in a different, more distant region in the Northern Caucasus. The contemporary Cossacks no longer speak Tatar, Polish, or Turkish, or meddle in geopolitics. However, the difference between 17th and 20th century Cossacks is not purely linguistic. The link between their self-identification and the countries in which they lived has strengthened, as now Russian Cossacks associate themselves strongly with Russia, and Ukrainian Cossacks have not forgotten their Zaporizh roots. The strength of these links is such, that Cossacks are often blamed for nationalism and xenophobia. However, in their home regions the Cossack people just stick to their traditions, consider their service in the Army an honorable duty and are proud to call themselves Cossacks as centuries before. The post-Soviet authorities clearly realized the importance of the Cossack theme, as different political forces pursued it in the 1990s after a period of what seemed like oblivion. Among other purposes, probably in the light of the Chechen War, was the use of Cossack units as auxiliary border troops and for security enforcement in their regions. Also, some economic provisions regulating the life of Cossack communities were proposed. These laws did not change much in substance except for the actual recognition of the Cossacks’ existence, so a lot depends on future legislative acts. These legal efforts helped little to revive Cossack life, their role in the state service and promotion of self-government in their traditional regions. Cossacks have been known for their self-organization talents, not impacted by the lack of unity, although their independent spirit may not always have coincided with the mainstream politics. After the cataclysms of the 20th century, Cossacks were dispersed around the country like mercury, difficult to regroup. However, according to the 2002 census, there were c140,000 people in Russia who called themselves Cossacks (compared to c2,900,000 in 1897) and who did not select the option “Russian” in the nationality section of the survey. A something of a post-script, in June 2013, the population in the Russian town of Pugachev demanded the expulsion of migrants after a criminal incident and briefly shut the federal road, trying to attract attention. In the 18th century, the rebellious Ataman Pugachev set off to start his war from this very place. These events look like a weak reminder of the past (the Cossack local influence is now ephemeral) but this high profile incident was followed by a chain of ethnic issues in the country during the summer. Do places make men?